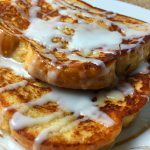 This French Toast recipe uses your favorite regular white bread and adds the sweet goodness of cinnamon and an icing that you will absolutely love. The ingredient list is simple and you will most likely have all the ingredients already in your pantry. No worries about buying special bread just for this one recipe. I absolutely love cinnamon rolls. And I love french toast. So how about we combine the best of both? No problem! All we need to do is add some ground cinnamon to our egg batter, and then make the delicious cinnamon roll icing to drizzle over the top. You won’t believe how easy it is to make the icing. Just add 1 tablespoon of milk and 1 cup of powdered sugar. Mix them together with a spoon and suddenly it becomes a sweet and delicious icing. Perfect for topping our cinnamon infused French Toast. Be sure to add the butter to your griddle before adding the bread. The butter adds a richness that is delicious and also helps create that beautiful golden color. Once the French Toast is done, all you do is use a spoon and drizzle the icing on top, right on your place. You can add syrup if you want, but you really won’t need it. Enjoy all the sweet cinnamon goodness as it was meant to be. I think you’ll love this recipe! In a large bowl, beat eggs with 2/3 cup milk, vanilla extract, cinnamon ans salt. In another bowl, mix 1 cup of powdered sugar with 1tbs milk. Set aside. Heat griddle over medium heat and add butter. Dunk pieces of bread in egg mixture and make sure both sides are well coated. Place on heated griddle and cook on each side until golden brown – about 2 minutes per side. 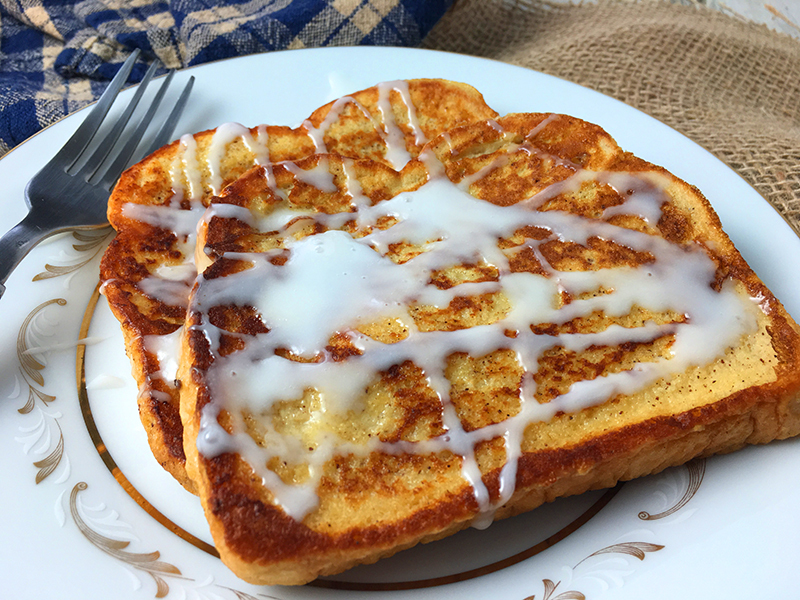 Plate the cooked French toast and use a spoon to drizzle icing mixture over top.